Ordinary girls leggings these are not! We specifically pick outgoing and colorful stripes, jeggings & prints so they can make any outfit POP. And these are cut to be a little bit longer. Note the fun, bunchy look around the ankle on the model picture. Tuck the socks inside and then pull the legging over the socks. It gives the leg a much better line with a little volume at the ankle, than just a stick straight line flaring out into a foot. As you can see, we put the same amount of thought and attention to detail in our leggings for girls as we do the rest of our clothing. We choose only the softest, most comfortable fabrics so that she'll want to wear them all the time. 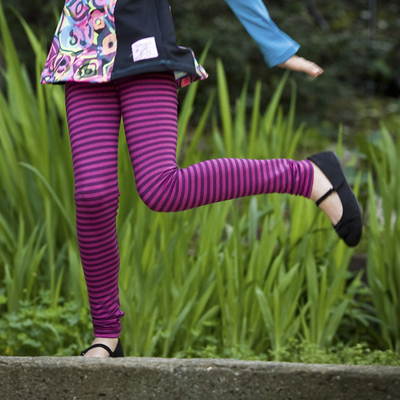 Our girls leggings also go comfortably inside high top sneakers or boots. Perfect for under our very twirly dresses and skirts, girls can also wear our leggings alone. And because they pack so small, they're also perfect for travel. Just roll them up and stuff them in your luggage. This makes them ideal for airplane trips as an emergency pair of pants. And since they're so comfy, our girls leggings are ideal for lounging around the house or hanging with friends on a sleepover. We're often asked which leggings go with which dresses. As you can see, our clothing isn't very "matchy-matchy." Because our styles are absolutely bursting with color, it's perfectly fine to wear girls leggings that are a complete different color. So think of them as complimentary, not matching. However, if that's not your taste, then we recommend choosing a pair of leggings that pulls any of the colors from our dresses. If you want further assistance, please don't hesitate to contact us. One of our style coordinators will be happy to help you pick out girls leggings to go with her dress or skirt.